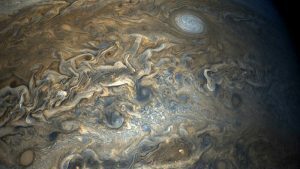 NASA’s Juno probe has sent thrilling images of Jupiter back to Earth, the largest planet in the solar system. 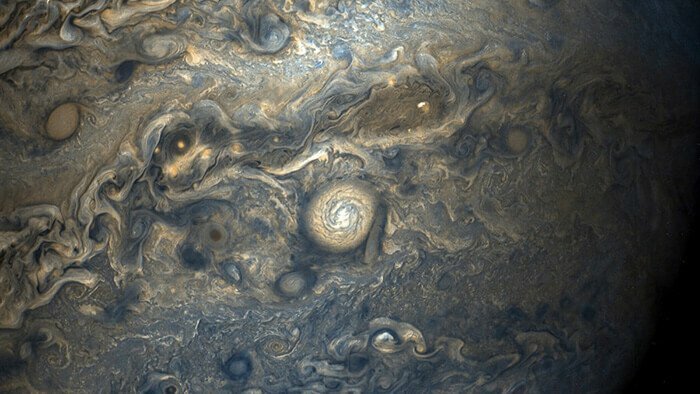 The fresh close-up images of Jupiter share unbelievable views of a hidden world. 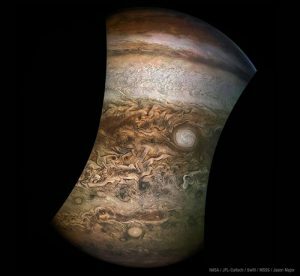 This is the ninth perijove, or high speed flyby, that has been sent to Jupiter to capture footage at more than 310,000 kilometres an hour. The data has been processed and now the colourful and amazing images of Jupiter are available for us to see. 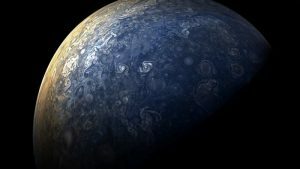 In the most recent flyby, as with the previous eight, Juno’s flight started over Jupiter’s north pole. 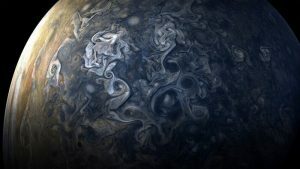 The spacecraft then travelled incredibly close to the enormous planet–which is nearly a solar system itself, with its dozens of moons–and went to within a few thousand miles of its surface, capturing amazing views of the cloud tops. The one billion dollar space probe then flew out into deep space and passed over Jupiter’s south pole. The stunning images capture the stormy, gaseous nature of this monster planet, many images looking like artworks rather than the surface of a planet that is over twice the size of all the planets in the solar system combined. 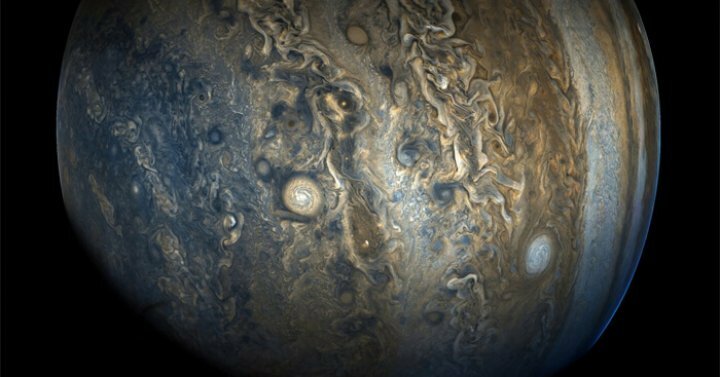 In fact, the immense volume of Jupiter could hold more than 1,300 Earths. 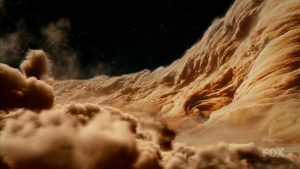 The images clearly show Jupiter’s signature colourful bands and the white clouds in the zones, made of crystals of frozen ammonia. The famous Jupiter storms, many of which are large enough to swallow up Earth, are also visible. Known as the gas giant, Jupiter’s atmosphere is a turbulent and volatile mixture of hydrogen and helium gases, along with traces of molecules such as ammonia, methane, sulphur, and water. The gaseous compounds create some incredible swirling colours and properties in the clouds, which have been captured by the perijove. 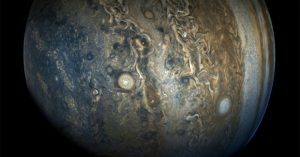 The spacecraft, which at one point was the fastest human-made object in the solar system, will continue to document Jupiter and send back more footage of this wild planet we share the solar system with, for as long as NASA can keep it going. 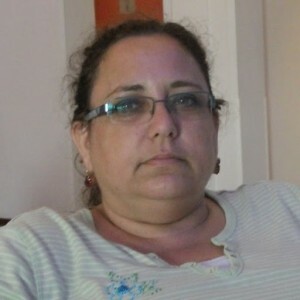 This entry was posted in Astronomy, Space, Space Exploration. Bookmark the permalink.